Provide the main interface to all operations of projecting coordinates from sky to screen. The StelProjector also defines the viewport size and position. All positions in pixels are in real device pixels, which is not the same as device independent pixels. On a mac with retina screen, there are 2 device pixels per pixels. All methods from this class are threadsafe. The usual usage is to create local instances of StelProjectorP using the getProjection() method from StelCore where needed. For performing drawing using a particular projection, refer to the StelPainter class. Definition at line 37 of file StelProjector.hpp. Definition at line 46 of file StelProjector.hpp. Definition at line 86 of file StelProjector.hpp. Definition at line 128 of file StelProjector.hpp. Private constructor. Only StelCore can create instances of StelProjector. Definition at line 290 of file StelProjector.hpp. Apply the transformation in the backward projection in place. Implemented in StelProjector2d, StelProjectorMiller, StelProjectorSinusoidal, StelProjectorOrthographic, StelProjectorMercator, StelProjectorCylinder, StelProjectorHammer, StelProjectorFisheye, StelProjectorStereographic, StelProjectorEqualArea, and StelProjectorPerspective. Check to see if a 2d position is inside the viewport. Return the small zoom increment to use at the given FOV for nice movements. 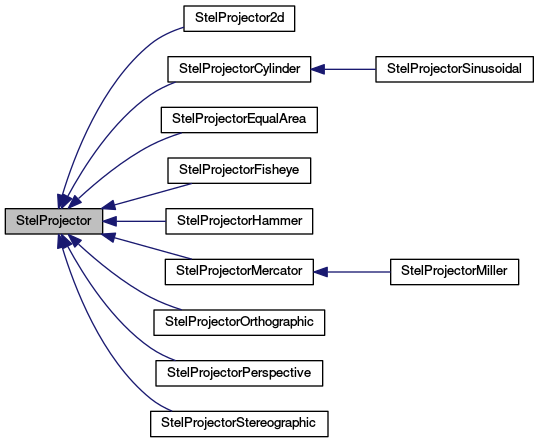 Implemented in StelProjector2d, StelProjectorOrthographic, StelProjectorMercator, StelProjectorCylinder, StelProjectorHammer, StelProjectorFisheye, StelProjectorStereographic, StelProjectorEqualArea, and StelProjectorPerspective. Apply the transformation in the forward direction in place. After transformation v will always contain the length of the original v: sqrt(v*v+v*v+v*v) regardless of the projection type. This makes it possible to implement depth buffer testing in a way independent of the projection type. I would like to return the squared length instead of the length because of performance reasons. But then far away objects are not textured any more, perhaps because of a depth buffer overflow although the depth test is disabled? Return a SphericalCap containing the whole viewport. Get a human-readable short description for this projection type. Reimplemented in StelProjector2d, StelProjectorMiller, StelProjectorSinusoidal, StelProjectorOrthographic, StelProjectorMercator, StelProjectorCylinder, StelProjectorHammer, StelProjectorFisheye, StelProjectorStereographic, StelProjectorEqualArea, and StelProjectorPerspective. Definition at line 135 of file StelProjector.hpp. Get the number of device pixels per "Device Independent Pixels" (value is usually 1, but 2 for mac retina screens). Definition at line 185 of file StelProjector.hpp. Get the current state of the flag which decides whether to arrage labels so that they are aligned with the bottom of a 2d screen, or a 3d dome. Get the current FOV diameter in degrees. Get a HTML version of the short description for this projection type. Get the current type of the mask if any. Get the maximum FOV apperture in degree. Implemented in StelProjector2d, StelProjectorMiller, StelProjectorOrthographic, StelProjectorMercator, StelProjectorCylinder, StelProjectorHammer, StelProjectorFisheye, StelProjectorStereographic, StelProjectorEqualArea, and StelProjectorPerspective. Get the current model view matrix. Get a human-readable name for this projection type. Get size of a radian in pixels at the center of the viewport disk. Get the current projection matrix. Get the lower left corner of the viewport and the width, height. Get the center of the viewport relative to the lower left corner of the screen. Return a convex polygon on the sphere which includes the viewport in the current frame. marginX an extra margin in pixel which extends the polygon size in the X direction. marginY an extra margin in pixel which extends the polygon size in the Y direction. a SphericalConvexPolygon or the special fullSky region if the viewport cannot be represented by a convex polygon (e.g. if aperture > 180 deg). Get the viewport height in pixels. Get the horizontal viewport offset in pixels. Get the vertical viewport offset in pixels. Get the viewport width in pixels. Return whether the projection presents discontinuities. Used for optimization. Determine whether a great circle connection p1 and p2 intersects with a projection discontinuity. For many projections without discontinuity, this should return always false, but for other like cylindrical projection it will return true if the line cuts the wrap-around line (i.e. at lon=180 if the observer look at lon=0). Determine whether a cap intersects with a projection discontinuity. Get a string description of a StelProjectorMaskType. Get whether front faces need to be oriented in the clockwise direction. Project the vector v from the current frame into the viewport. v the vector in the current frame. win the projected vector in the viewport 2D frame. true if the projected coordinate is valid. v the direction vector in the current frame. Does not need to be normalized. win the projected vector in the viewport 2D frame. win and win are in screen pixels, win is unused. true if the projected point is inside the viewport. vd the vector in the current frame. Project the vectors v1 and v2 from the current frame into the viewport. v1 the first vector in the current frame. v2 the second vector in the current frame. win1 the first projected vector in the viewport 2D frame. win2 the second projected vector in the viewport 2D frame. true if at least one of the projected vector is within the viewport. Get a StelProjectorMaskType from a string description. Project the vector v from the viewport frame into the current frame. win the vector in the viewport 2D frame. win and win are in screen pixels, win is unused. v the unprojected direction vector in the current frame. Convert a ViewScalingFactor value (used internally) in Field Of View radius in radians.